The 1,245 homeless people counted in Spokane and Spokane County last January is nowhere close to the number in other major cities. If someone were to tell you that Spokane's homeless population ranks fifth highest among cities in the United States, how would you react? It would likely be some mix of shock and outrage, judging by the reaction to two articles from local TV stations in recent days. Both KREM and KXLY reported in recent days that Spokane has the fifth highest homeless population of urban cities in the U.S., basing the information on a recent report from the U.S. Department of Housing and Urban Development (HUD) that looked at a regional count done for Spokane and Spokane County. Both articles generated plenty of interest, spreading quickly on social media and sparking arguments over how local leaders are handling the issue. To be clear: That's not exactly what the report said. "We think that report is being misinterpreted," says Kelly Keenan, the city's Community Housing and Human Services director. Yes, HUD's Annual Homeless Assessment Report counted 1,245 people experiencing homelessness in Spokane County in 2018. And yes, that put Spokane as fifth among what HUD calls "other largely urban" areas. But what those news articles left out is that the "other largely urban" category doesn't include any of the 50 largest cities in the country. And it's not necessarily comparing Spokane to cities of similar size either, Keenan says. The top five overall is closer to what you might expect: New York City, Los Angeles, Seattle, San Diego and San Jose. "We're not No. 5 in the country, we're No. 5 in a category that nobody understands," says Maurice Smith, media liaison for the Spokane Homeless Coalition, a network of agencies trying to address homelessness in the region. The HUD report defines the "other largely urban" category as any place where the population "predominantly resides in an urbanized area," but that's not one of the top 50 largest cities, nor does it include populations predominantly residing in suburban or rural areas. KREM's video segment explained this more clearly than their article did. 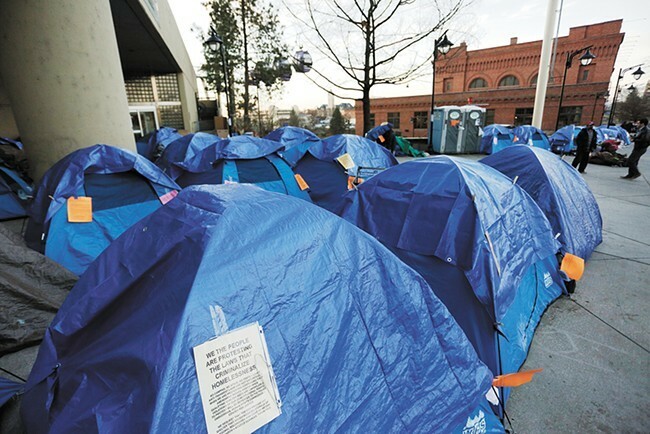 KREM corrected their story since originally posting it, though Keenan says the current headline — "Spokane has high homeless population for city size, federal report says" — remains a misinterpretation. And one can argue that KXLY was technically accurate when reporting Spokane's ranking as being "in largely urban" cities, since it's the same language HUD uses in their report. Yet devoid of any other context, Smith says, it can be a wildly misleading claim that would surprise the average reader. While the city wants to clarify what the report actually said, Keenan says "none of that is to try to downplay the challenge we know [that] does exist in our community." He says the city is continuing to work on investing in services and facilities that can improve circumstances for homeless individuals. Washington as a state has the fifth highest number of homeless individuals and was among the states seeing the highest increase of homeless individuals when compared to the year before, according to the report. Keenan says the city wasn't necessarily surprised to see that. "On the West Coast of the U.S., the challenge of homelessness is a particular issue right now," Keenan says. The HUD report also counted 249 "chronically homeless" individuals in Spokane alone, which is defined as people who are either disabled and have been homeless for one year or more, or those who have experienced at least four episodes of homelessness over the last three years lasting a combined 12 months or more. Smith, with the Spokane Homeless Coalition, says that needs to be addressed by the community. "Those folks are going to be the biggest challenge because you're dealing with people who often times have lost hope and they're going to be a challenge to place," Smith says. "We need to find a way to love them and find a way that's going to work for them."